Most other sports around the world have moved to multiple on-field umpires. Australian Rules Football has gone from one to four, rugby league from one to two, and basketball has two. Football is an exception here, but with the ball movement and rather simple rules, there really is no need for an additional referee. I do not put forward this proposition lightly, because an extra referee does not necessarily equate to better decision making. But there are several areas that a second referee could help police and provide a second set of eyes. The first is the offside line. It is hard enough for the referee to police the ruck while watching the offside line. The same goes for restarts, where players are often past the kicker. The second major use would be at scrums. Firstly, the binding on both sides could be more readily policed, along with the illegal tactic of angling in by the defensive props. It would also help watch out for backrow forwards that fail to stay bound, as well as again monitor the offside line as the ball comes out. I love the intricacies of rugby union and the multitude of skills that each player must have. It also comes with a complex set of rules and interpretations. The way forward is unclear as we do not want to simplify our great game beyond recognition, for its difficulty and complexity is at the very essence of what makes it so great. 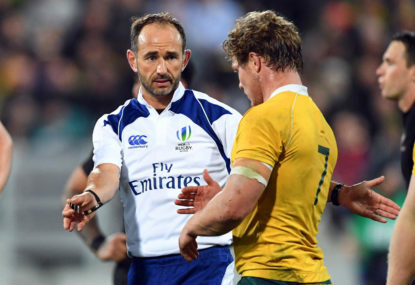 But until we figure out that path and find that balance, a second on-field referee could improve the officiating problems that plague rugby union.